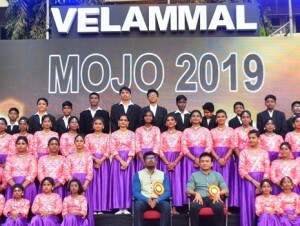 Velammal Main School, Mugappair campus celebrated 33rd Annual Day – MOJO 2019 and Vel’s Maha Utsav in the school premises with great pomp and show on 9th Feb. in the benign presence of Dr. N. Dilipan, IRS (Asst. Commissioner of GST & Central Excise) and Singer Unnikrishnan. The documentary showcased the key achievements of the school. The dazzling Salangai Pooja and Arangetram reminded the spectators of the nuances of Indian classical dance. The yoga demonstrated to the audience the necessity of leading a healthy life thro’ regular exercise. The fusion dance was unique and fascinating. Varnaa, the display of exquisite and exceptional 1001 paintings bewitched and enthralled the audience. It was a remarkable day for one and all.